Well, that’s another week done - it seems like we’re in and out of the Den in a flash. It must feel like a lifetime to the entrepreneurs though, especially when the reception is as frosty as it was tonight! Even though the atmosphere was cold enough to freeze the gluten-free chicken, some warm IP inspiration still filtered through. An area of technology that seems to be constantly developing is apps. Wherever you look, there’s an app popping up that can do something you never knew you needed. From controlling your central heating to cooking your dinner or mowing the lawn while you relax, it's all possible. That’s why Akhtar Khalil’s My Smart Remote caught my eye. Akhtar Khalil with My Smart Remote. Before tonight, I’d never considered controlling my car with an app and, like many of the Dragons; I’m not sure why I’d need to. But in all honesty, it’s a piece of technology that I found rather intriguing. 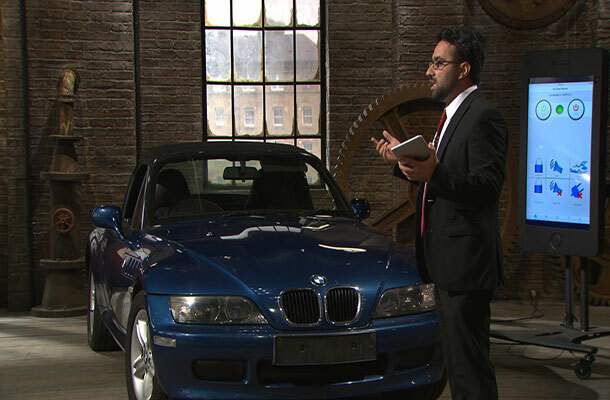 But how can Dr Khalil protect this new piece of ‘KIT’ (as Sarah Willingham put it)? Copyright protects most software. Generally, computer programs, games and apps are all protected in the same way as literary or creative works. This means that the copyright protects the visual content and look of your app, but not the underlying idea behind it. It allows you to take action against anyone who copies your content, as well as those who recreate the app without permission. If you’re unsure whether your invention in patentable, you should seek advice and guidance from an IP professional. Of course it’s not only software that could benefit from a patent alternative. Howard Barr’s Rain Diva may be a product you would expect to be protected by a patent. But does it fit the criteria? And would it be a viable business decision to spend thousands of pounds on a patent for a product that might not be a huge commercial success? I’ll take my hat off to anyone who could achieve this, but sometimes a better IP route to follow would be to apply for a registered design. As we’ve mentioned in past posts, a registered design protects the appearance of a product. A relatively cheap option in the IP world, a registered design can be obtained from as little as £60. Applications are usually examined within 1 month and registered immediately, unless you ask to defer it. This is a great if your product looks unlike anything else available, or if it's visually recognisable as one of your products. Unfortunately for Howard, the style savvy Dragons decided against investing. But just because these five fiery businesspeople rained on his parade, it doesn’t mean there’s no future in the product. Setting up business in new markets or new countries is a great way to grown your business. But don’t forget that your assets will still need looking after and protecting your IP overseas is vital. Remember, a registered design in the UK won’t protect your product when it’s retailing in Singapore. Tonight’s episode saw new Dragon Sarah Willingham invest £40,000 for 40% in Polly Gotschi’s business Vitiliglow, congratulations to Polly. Do you think your business would stand up to the test of the Dragons? Or would it fall apart when it came to your IP protection? Why not take some time over the next 7 days to find out. Our IP for Business tools will give you all the information and guidance you need to know. Developing apps seem to be very popular these days. Its an interesting insight into protecting software via patent protection. Along with many things the US seems to have made far greater strides in order to provide a framework for software development to be protected by patent registration. I suspect this is because the US recognized much earlier that software would be a key innovation and therefore having all the necessary IP protection would be key to its future development - lets hope the UK continues to develop this area too. In my experience many companies outsource much of the app development to third parties/ consultants. Its very important for the company to ensure that all the IP in the development by the third party/ consultant is assigned to the company. Such an IP clause can be included in the contract between the company and the developer.